Life is such a disaster around me I just sit here and stare. Right now it's easier for me to leave the house than to sit here in it and figure out what to do first. I simply do not know. Until January 30, 2014 our plan was to move to Ecuador. We had big plans. A little place in the country. Fruit trees, gardens, animals. It was years of planning that we put into this dream. His diagnosis changed that instantly. 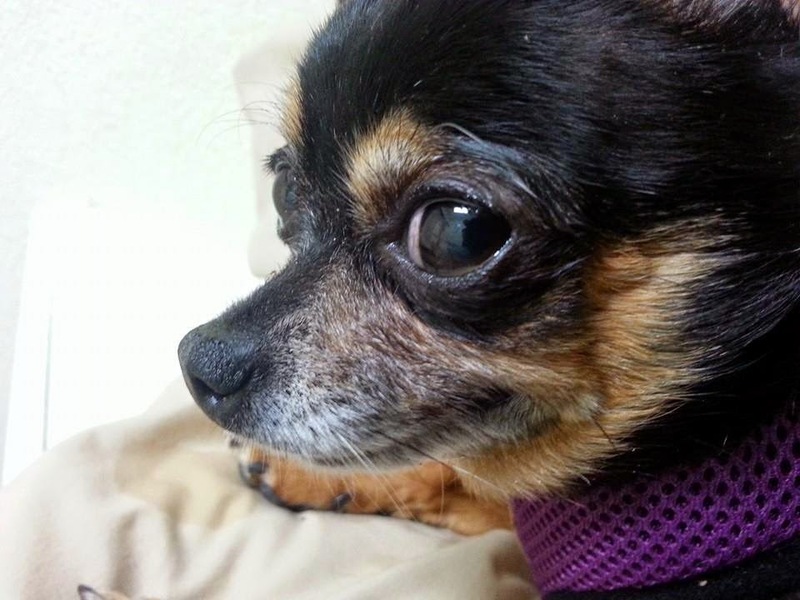 We couldn't move so far away from family knowing he was terminally ill. It then changed to Florida so he could be near his family. I searched homes every day looking for one that would work. His family would go check on things. I thought we had found one but Mikey hated it. It was out. This went on for months. It was frustrating. Mikey would sit in his room and sing "Home." Just the chorus. Over and over. It broke my heart because I was doing everything I could to get him home. In November 2014 he called me into the room. He said he didn't want to go to Florida. He wanted to go to his home where he was surrounded by love and so was I. He wanted to go home to Minnesota. I cried. Tears of happiness. I would follow him anywhere but to go home to where my family is brought me so much joy. They were his family too. There weren't nearly as many homes where we were going as there were in the Florida area we were heading. I didn't have high hopes. I got online and there were three possibilities. I arranged for my Mom and Sister to go look. They took pictures. They loved it and so did we. A purchase agreement was made shortly after Thanksgiving. Everything was going somewhat well. 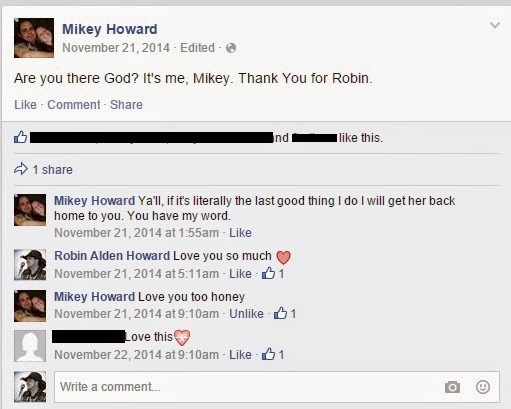 Mikey still sang "Home" every day. As we were going through the mortgage process we learned that for VA home mortgages they want to know every little detail of your life, past and present. It felt like an interrogation and was so completely frustrating. The same time I'm doing the mortgage I'm working on all of his VA paperwork, dealing with hospice care and taking are of him 24/7. Looking back I don't know how I did it except without a higher power. On January 7, 2015 I found Mikey unconscious in the bathroom. I do not know how long he had been there. I thought he was asleep and the monitor didn't alert me to him getting up. He was cold and I thought he was gone. I yelled for Karen to get in there with him while I made phone calls. She did and I yelled again to get him covered up. He finally responded and I took a breath. I still didn't know what was wrong and hospice told me to call the fire department for a lift assist. I think 6 people arrived, maybe more. Whomever I called turned it into a 911 call. Wrong. They didn't seem too happy about it but I showed them him hospice papers and advanced directives. Mikey started to respond more and I told the nurse to wait until the next day to come. I also knew at this point I had no time to waste in getting him home. I talked to the realtor and he arranged for us to do an early move-in agreement because the closing date was very near. Friday, January 9 I went to transportation and scheduled our move. I figured it would still be a week or two out. She arranged for the packers to come Monday morning January 12! I went home and made arrangements for motel rooms and did my best to get as much ready as I could over the next two days. The entire next week was a blur. Plane tickets were bought for Mikey and Karen who would be escorting him. Thank you Col Woodall for your help with that. The flight on January 20 was not without issues. Mikey's tremors caused his hat to come off and hit a woman. I'm sure not enough to even hurt her but she had a fit and demanded he be removed from the flight. She did not care what was wrong with him, he hit her with his hat! I will let you insert your own thoughts here. The airline who was supposed to be assisting with transfers did nothing and at one point even separated Mikey and Karen. Mikey should NEVER have been left unattended. He fell out of his chair, twice. People stood and watched as he lay on the floor and Karen struggled to get him back up. But they made it and there was family to pick them up and get them into the house safely. The same time they got on the plane I took off driving with my sister as co-pilot. 4 cats in carriers that were not happy and verbalized their disdain. Two dogs, one of which was not doing well from the stress. Little Bit. This was all very hard on her. She ended up riding on Jenny's lap for most of the trip. She wouldn't use the bathroom. She wouldn't eat. She would lick ice. We made it to Witchita the first day. We found a motel that didn't care about all the pets and let us stay. We quickly went to bed and woke up at 2 am to eat breakfast and get back on the road. We pulled into our new home a little after 5pm January 21. Everyone was here and excited to see me and show me the house but first things first. I go down to where Mikey is and hug and kiss him and let him know I made it safely. It felt so good to touch him. It was a long 2 days worrying and traveling. Our household goods were delivered Saturday January 24. It was cold standing out in the garage as they brought things in. The heavy things anyway. Most things I had them leave in the garage, the boxes that I could go through when I had time. So many things were broken and if they weren't broken they don't work in some form or another. I spent the next few days opening boxes and wondering what I am going to do with all these things. I am still very overwhelmed and we have not yet closed on the house. That afternoon we closed on the house. It was stressful. The closing agent came to us and was trying to explain each page as Mikey signed. I finally had to say just point to where he needs to sign and we'll go over the paperwork when I sign. Mikey was relieved because he was done after the first signature. A bittersweet day for us. 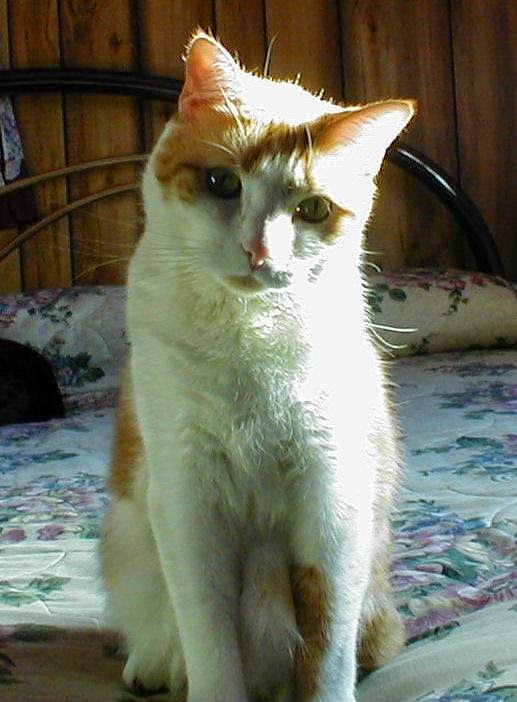 On January 30, one year after Mikey was diagnosed, I noticed Noodie (our 19 year old cat) was not doing well. 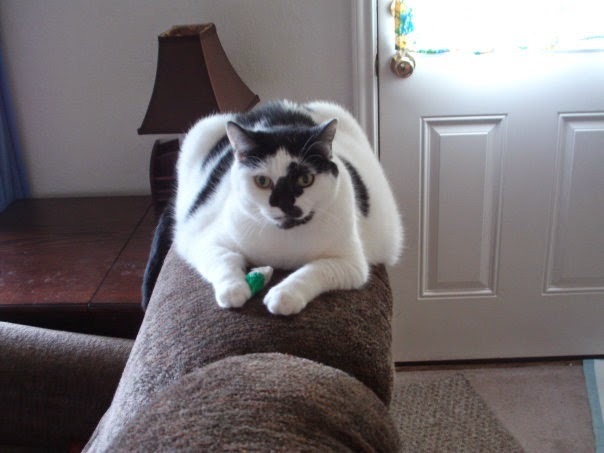 She had had feline dementia for a few years but was otherwise healthy. She was having problems moving, moving very slowly. Not eating. February 2 Noodie laid in bed next to Mikey. She had quit urinating. They cuddled as they always did. Mikey covering her to keep her warm. She went to be with Loki and Little Bit. February 3 I had a stark realization. 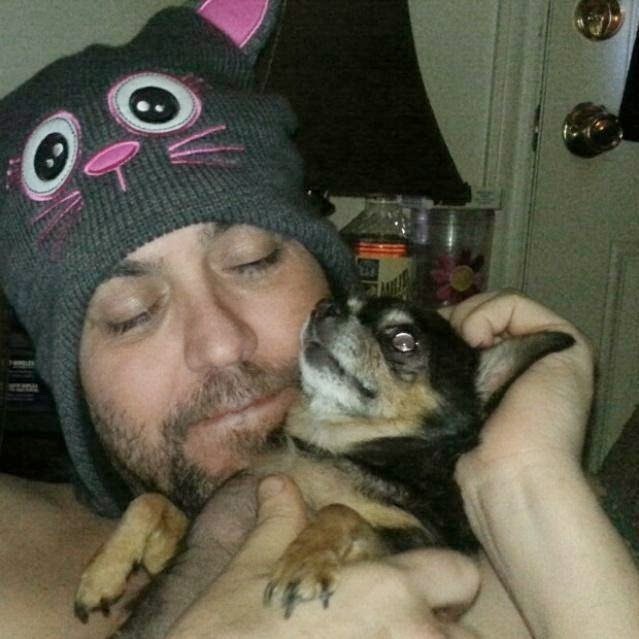 I talked with everyone that had been caring for Mikey the last three days. NONE of us had done something that we do routinely because it hadn't needed to be done. Empty his urinal. There was none. Not a single drop to empty. I knew immediately what it was. Acute renal failure. I called hospice. The nurse came and Mikey said he had gone. His sense of time has been bad for a while. I counted back the days to the last time I had emptied it. It was Sunday morning. I called his family. I prayed daily that something would happen. That his kidneys would start working again as quickly as they had shut down. Leading up to those days he had no problem at all with them. Surely this horrible disease and the way it jumped around could let loose of his kidneys and it would be alright. As the days passed and he even realized he wasn't urinating he would drink more fluids because he thought he was dehydrated. Nothing. I had been told the more fluids he took in the faster he may pass because it has no where to go. The nurses checked his bladder daily. There was nothing there. I knew now he was dying. This can't be happening so soon. This can't be real. His Mom and sister arrived on Friday February 6. My son was scheduled to arrive Sunday February 8. I told Mikey they were all on their way. The hospice nurses were amazed at his will to hang on. The day he passed is written about here. Ten days later and I sit here and look around and don't know what to do. Pieces of random trivia come up and I want to run in there and quiz him and reality hits we can no longer share random trivia. No more story telling all night long. No more laying in his lap to watch movies while he played with my hair. No more anything. The boxes are still piled up. Scattered. His room is the cleanest in the house. Set up with many of the thing he loved to have near him. Including his Christmas tree with the Angel Owl that he wanted to be looking at him at all times. His caribou fur covering his bed. Daisies on his table. His roosters looking out over him from another part of the room. There is so much to do and no where to begin. Then there is paperwork. Notifications. People are still finding out. Piles of mail. Thank you notes. I am thankful that my family is feeding me. Cooking right now is too much. Cooking is to much of a memory with Mikey. One thing is for certain. He kept his last promise made and got us home.